Réduire la possibilité de problèmes de matériel ou de logiciel en vérifiant périodiquement de façon systématique le fonctionnement de ceux-ci. Réduire le temps d’arrêt d’un ordinateur ainsi que les coûts de réparation. Slide 5 – The Purpose of Preventive Maintenance 4.1 Explain the purpose of preventive maintenance Preventive maintenance is used to reduce the likelihood of hardware or software problems by systematically and periodically checking hardware and software to ensure proper operation. Teaching Strategy: The purpose of preventive maintenance is to prevent problems pro-actively. A regular schedule of preventive maintenance allows you to perform many actions that will keep problems from developing. It also allows you to choose the time and place of equipment servicing rather than the occurrence of failures dictating when these activities are performed. To protect the computer, extend the life of the components, and protect the data, proper preventive maintenance is required. Performance issues may arise without regular maintenance and cleaning. Reliable and stable equipment is a result of good preventive maintenance procedures. 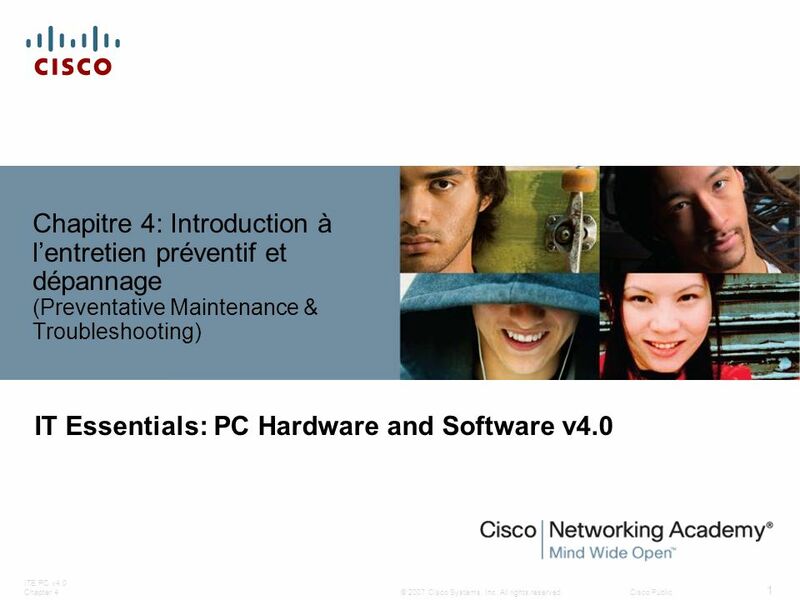 The purpose of this chapter is to introduce you to the troubleshooting process and to describe preventive maintenance. Not all troubleshooting processes are the same. In time, you will develop your own troubleshooting style based on your personal experiences and the nature of your workplace. After completing this section, the student will meet the following objective: Explain what preventive maintenance is and why it is needed. S’assurer que le matériel fonctionne correctement Vérifier la condition des pièces. Réparer ou remplacer les pièces au besoin. Garder les pièces propres. Créer un plan d’entretien du matériel. 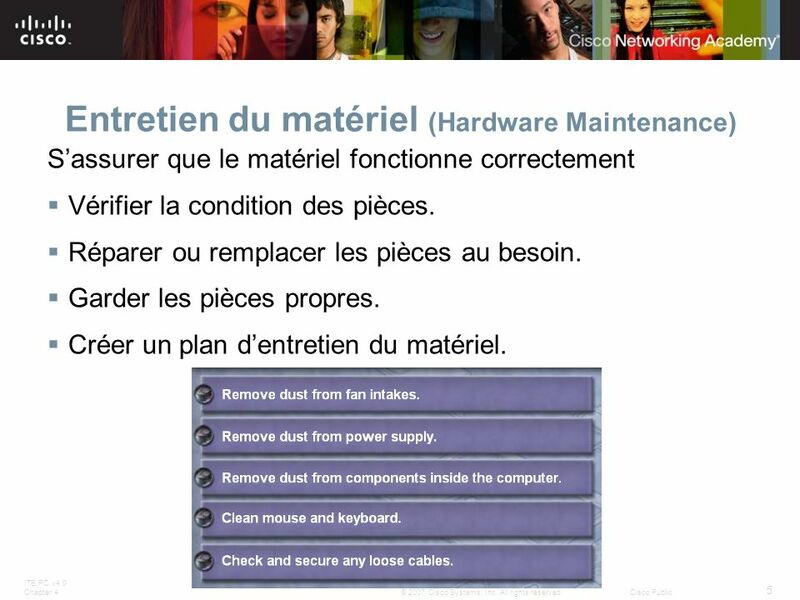 Slide 6 – Hardware Maintenance Make sure that the hardware is operating properly. Check the condition of cables, components, and peripherals. Repair or replace any components that show signs of abuse or excess wear. Keep components clean in order to reduce the likelihood of overheating. Use the tasks listed on the slide as a guide to create a hardware maintenance program that fits the needs of your computer equipment. Remove the dust from fan intakes. Remove dust from power supply. Remove dust from components inside the computer. Clean mouse and keyboard. Check and secure any loose cables. For example, some environments, such as construction sites, may require computer equipment to be cleaned more often than other environments. What additional hardware maintenance tasks can you add to the list? 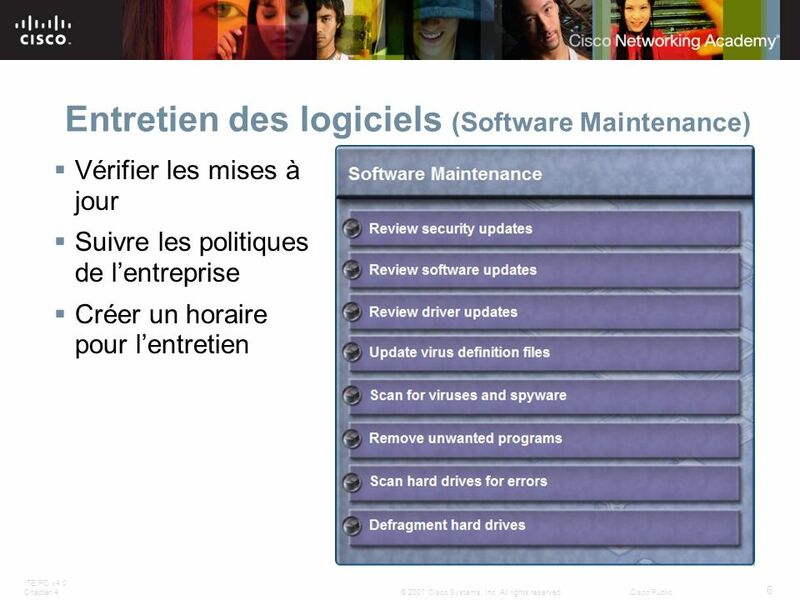 Vérifier les mises à jour Suivre les politiques de l’entreprise Créer un horaire pour l’entretien Slide 7 - Software Maintenance Verify that the installed software is current. Follow the policies of the organization when installing security updates, operating system updates, and program updates. Many organizations do not allow updates until extensive testing has been completed. This testing is done to confirm that the update will not cause problems with the operating system and software. Use the tasks listed on the slide as a guide to create a software maintenance schedule that fits the needs of your computer equipment. Review security updates. Review software updates. Review driver updates. Update virus definition files. Scan for viruses and spyware. Remove unwanted programs. Scan hard drives for errors. Defragment hard drives. For example, high-traffic networks, such as a school network, may require additional scanning and removal of malicious software or unwanted files. What other software maintenance tasks can you add to the list? Réduit le temps d’arrêt de l’ordinateur. (downtime) Réduit le coût de réparation. Réduit la perte de production. 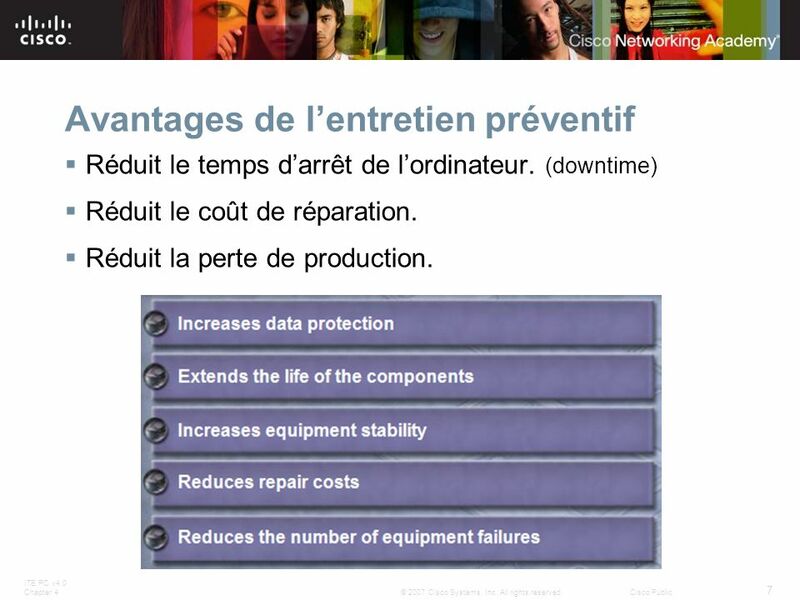 Slide 8 - Preventive Maintenance Benefits Be proactive in computer equipment maintenance and data protection. By performing regular maintenance routines, you can reduce potential hardware and software problems. This will reduce computer down time and repair costs. A preventive maintenance plan is developed based on the needs of the equipment. A computer exposed to a dusty environment, such as a construction site, will need more attention than equipment in an office environment. High-traffic networks, such as a school network, may require additional scanning and removal of malicious software or unwanted files. Document the routine maintenance tasks that must be performed on the computer equipment and the frequency of each task. This list of tasks can then be used to create a maintenance program. Increases data protection Extends the life of the components Increases equipment stability Reduces repair costs Reduces the number of equipment failures Can you think of any other benefits that preventive maintenance provides? Teaching Strategy: To protect the computer, extend the life of the components, and protect the data, proper preventive maintenance is required. Performance issues may arise without regular maintenance and cleaning. Reliable and stable equipment is a result of good preventive maintenance procedures. Suivre une procédure organisée et logique. Éliminer les variables une à la fois. Développer son aptitude dans le plan de dépannage avec l’expérience. Communiquer effectivement avec le client pour obtenir l’information et fournir les résultats. Slide 9 – The Troubleshooting Process 4.2 Identify the steps of the troubleshooting process Troubleshooting requires an organized and logical approach to problems with computers and other components. A logical approach to troubleshooting allows you to eliminate variables in a systematic order. Asking the right questions, testing the right hardware, and examining the right data helps you understand the problem. This helps you form a proposed solution to try. Troubleshooting is a skill that is refined over time. As you deal with more problems, you will increase your troubleshooting skills by gaining more experience. You will learn how to combine and skip steps to reach a solution quickly. The troubleshooting process is a guideline that can be modified to fit your needs. 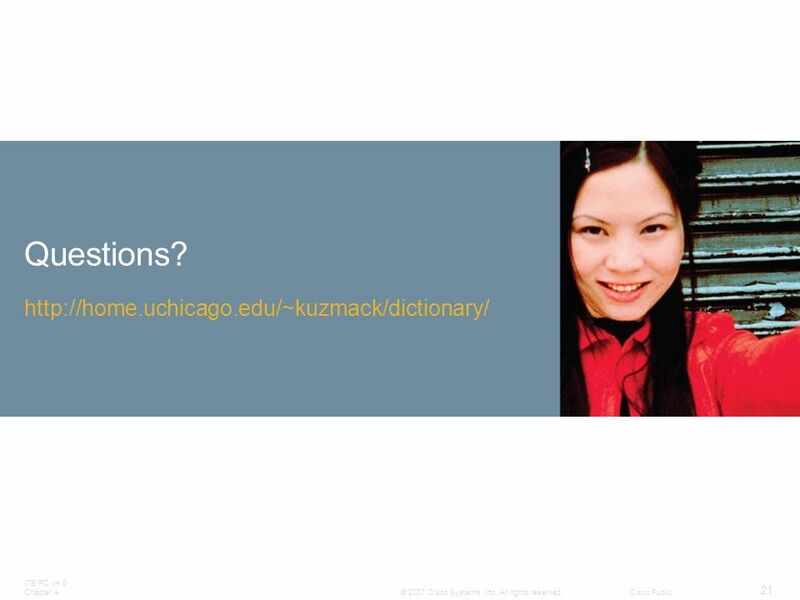 NOTE: The term customer, as used in this course, is any user that requires technical computer assistance. Teaching Strategy: There is a basic troubleshooting process that includes the elimination of variables one at a time in a logical progression. When following a structured approach to troubleshooting, you will avoid following unnecessary leads, which will waste time and cause frustration. A newly employed technician would benefit from following a senior technician on a repair job. Communication skills (soft skills) are very important to the success of a career as a repair technician. After completing this section, the student will meet the following objective: Explain the purpose of data protection Gather data from the customer Verify the obvious issues Try quick solutions first Gather data from the computer Evaluate the problem and determine the solution Close with the customer. Vérifier avec le client: Date de la dernière copie de sauvegarde (data backup) Contenu de la sauvegarde Intégrité de l’information dans la sauvegarde Disponibilité de média pour la restauration des données Si le client ne désire pas de sauvegarde, assurez-vous d’obtenir une décharge de responsabilité (release form) Slide 10 – Data Protection 4.2.1 Explain the purpose of data protection Before troubleshooting problems, always follow the necessary precautions to protect data on a computer. Some repairs, such as replacing a hard drive or reinstalling an operating system, may put the data on the computer at risk. Make sure that you do everything possible to prevent data loss while attempting repairs. Some data is irreplaceable. Before you attempt any type of repair or modification to a computer, make sure that the data has been properly backed up. CAUTION: Although data protection is not one of the six troubleshooting steps, you must protect data before beginning any work on a customer's computer. If your work results in data loss for the customer, you or your company could be held liable. If you are unsure that a backup has been done, do not attempt any troubleshooting activities until you check with the customer. Here is a list of items to verify with the customer about data backups: Date of the last backup Contents of the backup Data integrity of the backup Availability of all backup media for data restore If the customer does not have a current backup and you are not able to create one on the computer that has the problem, you should ask the customer to sign a liability release form. A liability release form should contain at least the following information: Permission to work on the computer without a current backup available Release from liability if data is lost or corrupted Description of the work to be performed Teaching Strategy: A technician should take precautions before starting the troubleshooting process. For liability reasons, either perform a backup or have access to a backup. Often, your best troubleshooting resource will be the owner or operator of the equipment which you are working on. Use software and hardware tools to make backups of the customer's data. Bring with you hardware and software that will allow you to change out suspect hardware with known good hardware and boot an operating system that is not booting properly. If you need to make repairs on a system that the customer has not backed-up and if the problem prevents you from making a backup, then obtain written permission from your customer to proceed without the backup. The customer must understand that there is an inherent risk to the data that is stored on the hard drive in many situations. 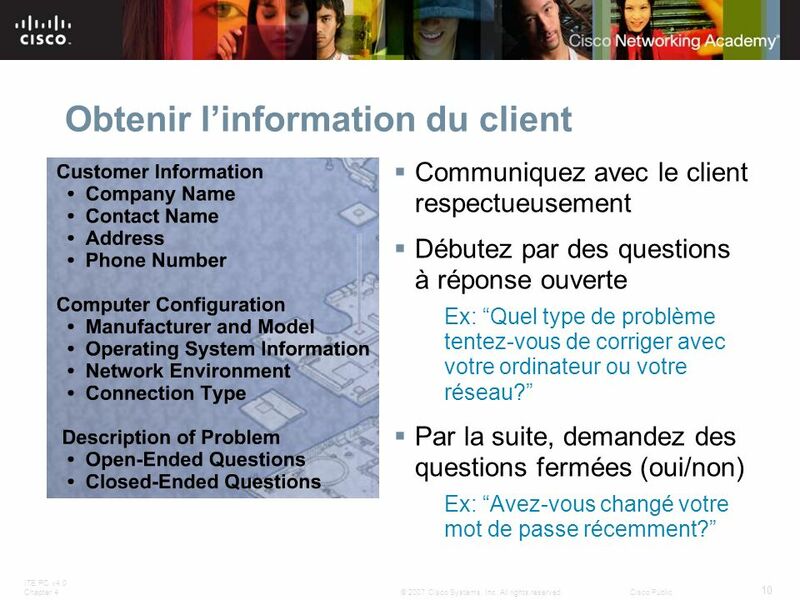 Communiquez avec le client respectueusement Débutez par des questions à réponse ouverte Ex: “Quel type de problème tentez-vous de corriger avec votre ordinateur ou votre réseau?” Par la suite, demandez des questions fermées (oui/non) Ex: “Avez-vous changé votre mot de passe récemment?” Slide 11 – Gather Data from the Customer 4.2.2 Gather data from the customer The customer will provide you with the basic facts about the problem. When you are talking to the customer, you should follow these guidelines: Ask direct questions to gather information. Do not use industry jargon when talking to customers. Do not talk down to the customer. Do not insult the customer. Do not accuse the customer of causing the problem. By communicating effectively, you will be able to elicit the most relevant information about the problem from the customer. You should start the data-gathering process by asking general, open-ended questions. Open-ended questions are used to obtain general information and allow the customer to explain the details of the problem in their own words. Use the information that you collect from open-ended questions to narrow down the problem with closed-ended questions. Closed-ended questions generally require a "yes" or "no" answer. These questions are intended to get the most relevant information in the shortest time possible. The information obtained from the customer should be documented in the work order and in the repair journal. Write down anything that you think may be important for you or another technician. Often, the small details can lead to the solution of a difficult or complicated problem. Teaching Strategy: Examples of the questions a technician might ask: When was the last time the computer worked properly? Was anything new added to the system (equipment or software, downloads, updates, auto-updates [live update], etc), power outages or lightning? Has there been any construction nearby? Is air-conditioning working properly? Has a circuit breaker tripped? Are there any utility trucks in the area? Slide Verify Obvious Issues 4.2.3 Verify the obvious issues The second step in the troubleshooting process is to check the simple or obvious issues first. Even though the customer may think that there is a major problem, start with the obvious issues before moving to more complex diagnoses. Here is a list of obvious issues to check: Loose external cable connections Incorrect boot order in BIOS Non-bootable disk in floppy drive Power switch for an outlet is turned off Surge protector is turned off Device is powered off If the problem is not resolved when you verify the obvious issues, you will need to continue with the troubleshooting process. If you find an obvious issue that fixes the problem, you can go to the last step and close with the customer. These steps are simply a guideline to help you solve problems in an efficient manner. Teaching Strategy: The customer may say that a device is broken, but the problem may be a connection issue or some other simple issue. 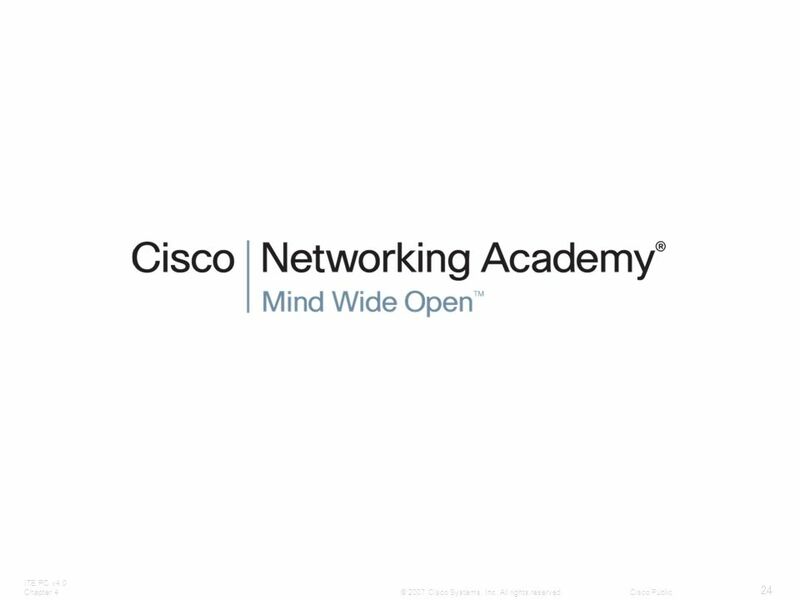 Even if the customer is in a panicked state, start with the basics before moving to more difficult troubleshooting techniques. This could save you and the customer time. Based upon the problem that the user is experiencing, make sure that simple, basic problems that can be easily seen and corrected are covered. Very often, obvious issues can be overlooked by the customer. The list of suggested obvious issues is not an exhaustive list. The more experience you gain with troubleshooting, the larger this list will become and the easier these problems will be to identify. Le problème pourrait être plus simple que le client croit. En commençant par les possibilités évidentes, vous pouvez sauver du temps. Si cette étape ne règle pas le problème, continuer à la prochaine étape de dépannage. Même si ces solutions ne résouent pas le problème, elles pourraient fournir de l’information additionnelle. Documenter chaque solution que vous tentez. Slide 13 – Try Quick Solutions 4.2.4 Try quick solutions first The next step in the troubleshooting process is to try quick solutions first. Obvious issues and quick solutions sometimes overlap each other and can be used together to repair the problem. Document each solution that you try. Information about the solutions that you have tried is vital if the problem needs to be escalated to another technician. If a quick solution does not resolve the problem, document your results and try the next most likely solution. Continue this process until you have solved the problem or tried all of the quick solutions. Au besoin, obtenir plus d’information du client. Si vous découvrez la solution au problème, assurez-vous de bien documenter votre démarche et procéder à la dernière étape de la procédure de dépannage. Lors du dépannage, allumer l’ordinateur et écouter la séquence de bip (beep code sequence). 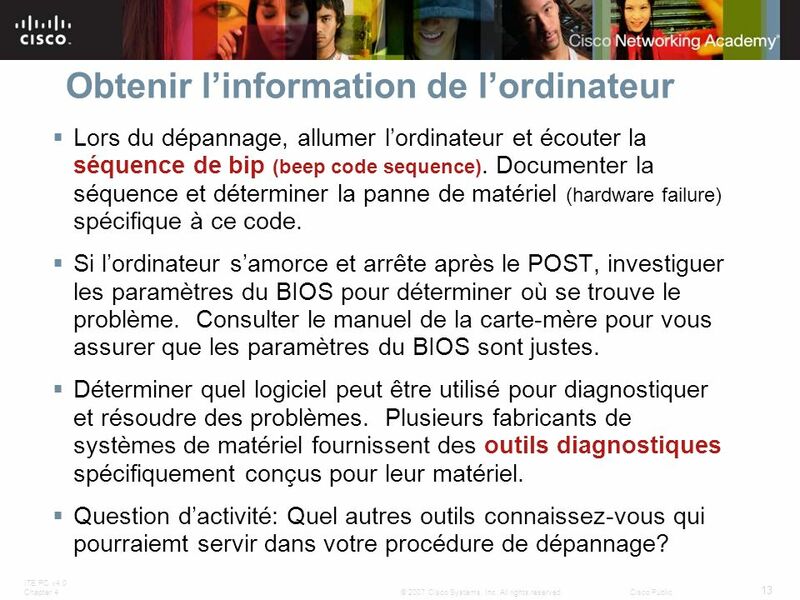 Documenter la séquence et déterminer la panne de matériel (hardware failure) spécifique à ce code. Si l’ordinateur s’amorce et arrête après le POST, investiguer les paramètres du BIOS pour déterminer où se trouve le problème. Consulter le manuel de la carte-mère pour vous assurer que les paramètres du BIOS sont justes. Déterminer quel logiciel peut être utilisé pour diagnostiquer et résoudre des problèmes. Plusieurs fabricants de systèmes de matériel fournissent des outils diagnostiques spécifiquement conçus pour leur matériel. Question d’activité: Quel autres outils connaissez-vous qui pourraiemt servir dans votre procédure de dépannage? Slide 16 – Gather Data from the Computer Each BIOS manufacturer has a unique beep sequence for hardware failures. When troubleshooting, power on the computer and listen. As the system proceeds through the POST, most computers will emit one beep to indicate that the system is booting properly. If there is an error, you may hear multiple beeps. Document the beep code sequence and research the code to determine the specific hardware failure. If the computer boots and stops after the POST, you should investigate the BIOS settings to determine where to find the problem. A device may not be detected or configured properly. Refer to the motherboard manual to make sure that the BIOS settings are accurate. Conduct research to determine what software is available to help diagnose and solve problems. There are many programs available that can help you troubleshoot hardware. Often, manufacturers of system hardware provide diagnostic tools of their own. A hard drive manufacturer, for instance, may provide a tool that can be used to boot the computer and diagnose problems with the hard drive when it will not boot Windows. Do you know of any third-party tools that you can use to troubleshoot computers? Teaching Strategy: Be prepared with information of various third-party tools to share with students. Discuss keywords to use when searching for these tools on the Internet. 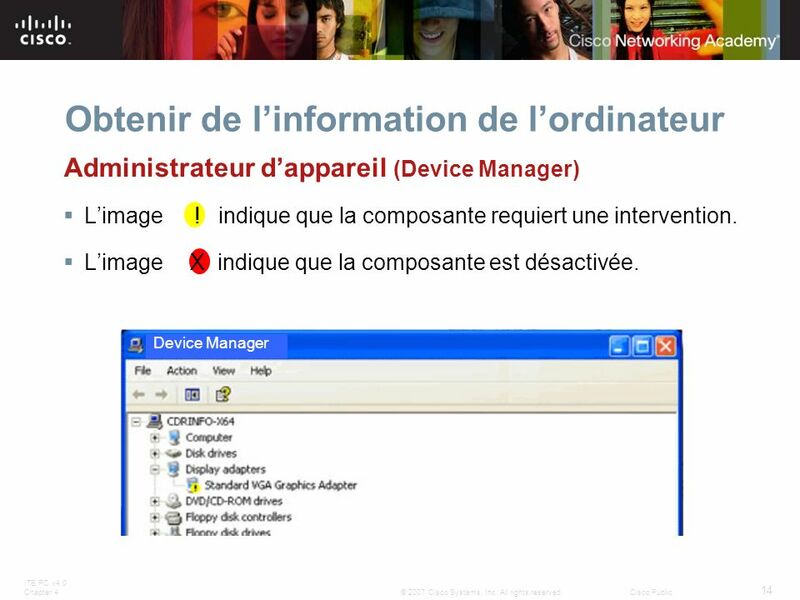 Administrateur d’appareil (Device Manager) L’image ! indique que la composante requiert une intervention. L’image X indique que la composante est désactivée. Device Manager Slide 15 – Gather Data from the Computer The Device Manager displays all of the devices that are configured on a computer. Any device that the operating system determines to be acting incorrectly will be flagged with an error icon. This type of error is denoted as a yellow circle with an exclamation point ("!"). If a device is disabled, it will be flagged with a red circle and an "X". 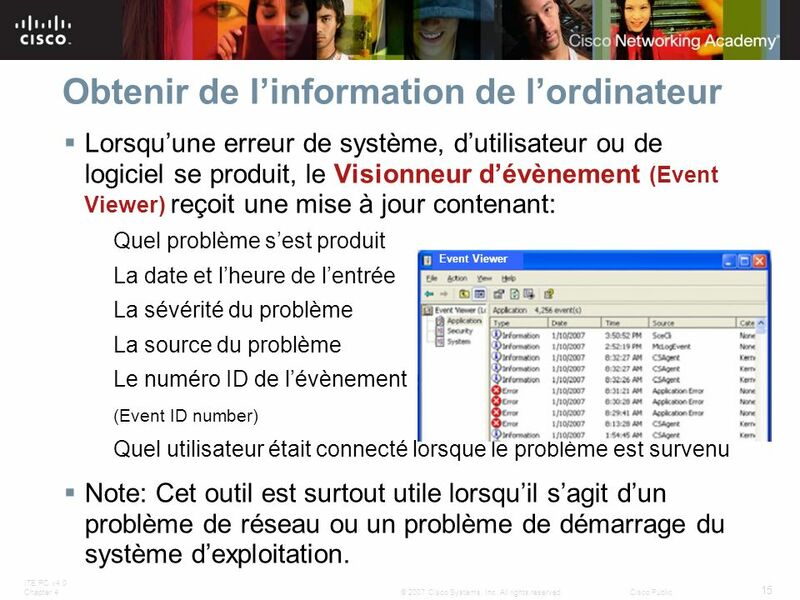 Lorsqu’une erreur de système, d’utilisateur ou de logiciel se produit, le Visionneur d’évènement (Event Viewer) reçoit une mise à jour contenant: Quel problème s’est produit La date et l’heure de l’entrée La sévérité du problème La source du problème Le numéro ID de l’évènement (Event ID number) Quel utilisateur était connecté lorsque le problème est survenu Note: Cet outil est surtout utile lorsqu’il s’agit d’un problème de réseau ou un problème de démarrage du système d’exploitation. Event Viewer Slide 14 – Gather Data from the Computer 4.2.5 Gather data from the computer The next step in the troubleshooting process is to gather data from the computer. You have tried all of the quick solutions, but the problem is still not resolved. It is now time to verify the customer's description of the problem by gathering data from the computer. When system, user, or software errors occur on a computer, the Event Viewer is updated with information about the errors. The Event Viewer application records the following information about the problem: What problem occurred The date and time of the problem The severity of the problem The source of the problem Event ID number Which user was logged in when the problem occurred Although this utility lists details about the error, you may still need to research the solution. Teaching Strategy: After you have determined the problem from the customer’s perspective, verified the obvious issues, and tried quick solutions, then it is time to gather data from the computer. Clues that the computer provides you can be found in the event logs, error codes, device manager, and the condition of the computer, peripherals, and other devices. Comparing information that the customer provided with information that you can get from the computer will narrow down the possible problems. 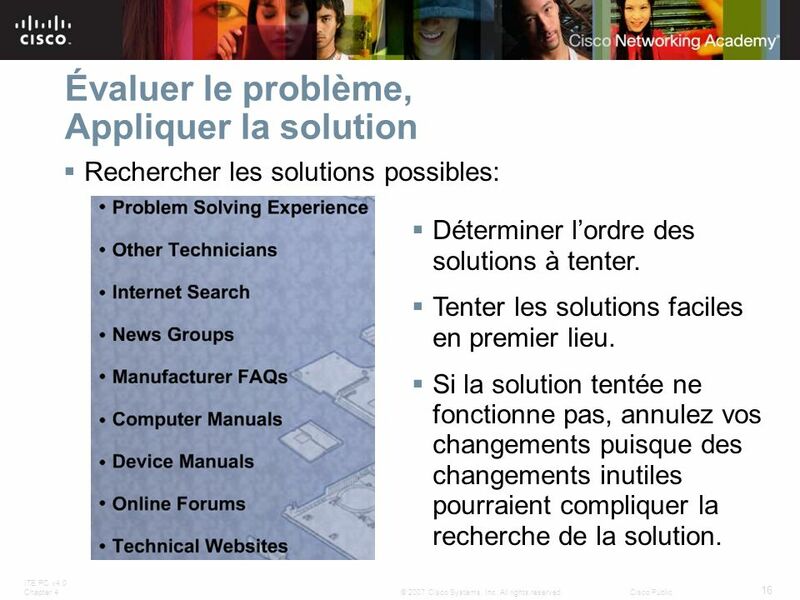 Rechercher les solutions possibles: Déterminer l’ordre des solutions à tenter. Tenter les solutions faciles en premier lieu. Si la solution tentée ne fonctionne pas, annulez vos changements puisque des changements inutiles pourraient compliquer la recherche de la solution. Slide 17 – Evaluate the Problem, Implement the Solution 4.2.6 Evaluate the problem and implement the solution The next step in the troubleshooting process is to evaluate the problem and implement the solution. Divide larger problems into smaller problems that can be analyzed and solved individually. Solutions should be prioritized, starting with the easiest and fastest to implement. Create a list of possible solutions and implement them one at a time. If you implement a possible solution and it does not work, reverse the solution and try another. 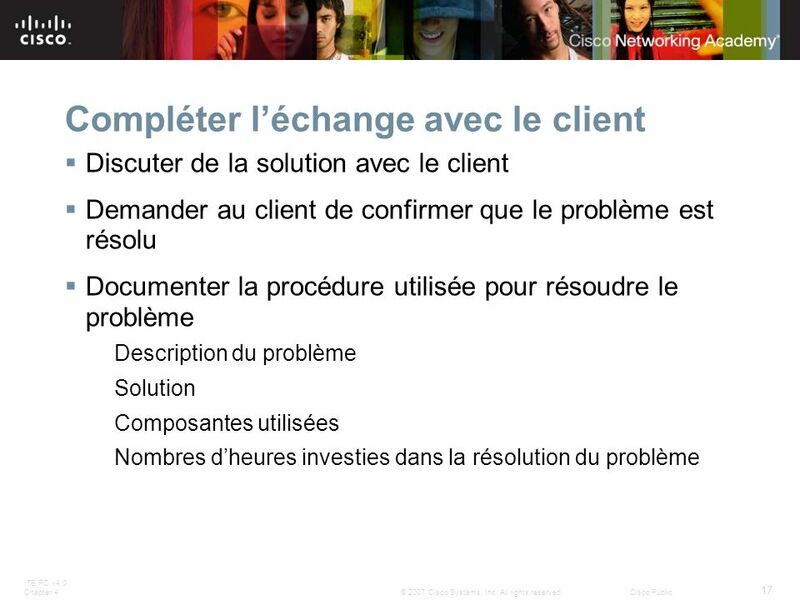 Discuter de la solution avec le client Demander au client de confirmer que le problème est résolu Documenter la procédure utilisée pour résoudre le problème Description du problème Solution Composantes utilisées Nombres d’heures investies dans la résolution du problème Slide 18 – Close with the Customer 4.2.7 Close with the customer After the repairs to the computer have been completed, you should finish the troubleshooting process by closing with the customer. Communicate the problem and the solution to the customer verbally and in all documentation. 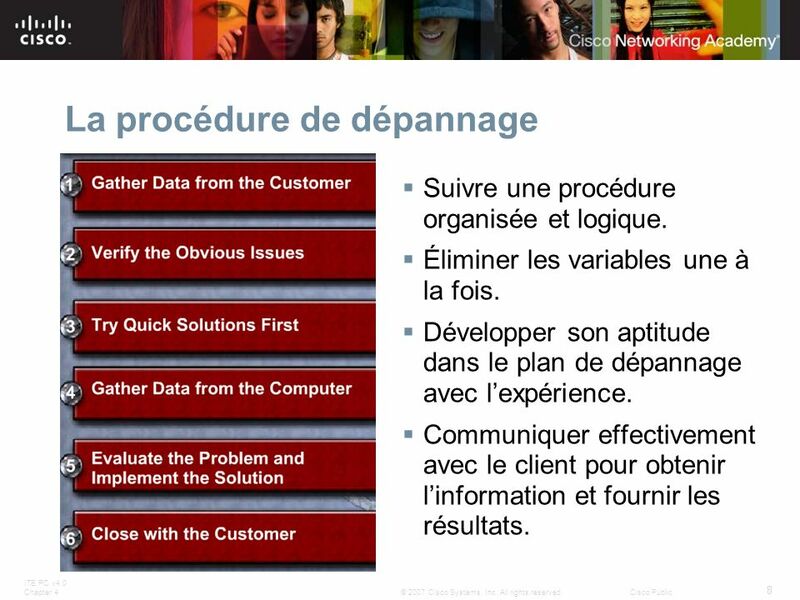 The steps involved in closing with the customer include: Discuss the solution implemented with the customer. If the customer is available, demonstrate how the solution has corrected the computer problem. Have the customer test the solution and try to reproduce the problem. 19 Sommaire: Chapitre 4 L’entretien préventif suivant un horaire prédéterminé réduit le nombre de problèmes de matériel et de logiciel. Avant de tenter de réparer, faites une copie de sauvegarde sur l’ordinateur. La procédure de dépannage est une méthode développée pour résoudre des problèmes d’ordinateurs efficacement. Slide 20 - Chapter 4 Summary This chapter discussed the concepts of preventive maintenance and the troubleshooting process. Regular preventive maintenance reduces hardware and software problems. Before beginning any repair, back up the data on a computer. The troubleshooting process is a guideline to help you solve computer problems in an efficient manner. Document everything that you try, even if it fails. The documentation that you create will become a useful resource for you and other technicians. Documenter tout ce que vous avez tenté même ce qui n’a pas fonctionné. Cette documentation sera une ressource utile la prochaine fois que vous verrez un problème semblable. Compiler une liste de tâches additionnelles qui pourraient être bénéfiques: a) Quel tâche d’entretien de matériel pourriez-vous ajouter à la liste initiale? b) Quel tâche d’entretien de logiciel pourriez-vous ajouter à la liste initiale? c) Quel autres bénéfices sont offerts en appliquant de l’entretien préventif? Obtenez des échantillons de bon de travail et de décharge de responsabilité. Que semblent être les informations essentielles? Nommez d’autres outils de diagnostique que vous connaissez et indiquez quel utilité ils peuvent offrir dans la procédure de dépannage. Slide 22 – Activities for Instructor Training These activities are suggested for use in instructor training. Take the Quiz provided in Chapter 4 course content. In 4.1, there are 3 questions posed to the students. Generate lists of additional tasks and benefits to refer to when teaching this course. What additional hardware maintenance tasks can you add to the list? What other software maintenance tasks can you add to the list? Can you think of any other benefits that preventive maintenance provides? Conduct research to collect samples of work order forms and liability release forms. Your own organization may have these available. In 4.2.5, software diagnostic tools are presented. List any third-party tools that you are familiar with that can be used to troubleshoot computers. If you don’t know of any, then conduct Internet research to identify a few. 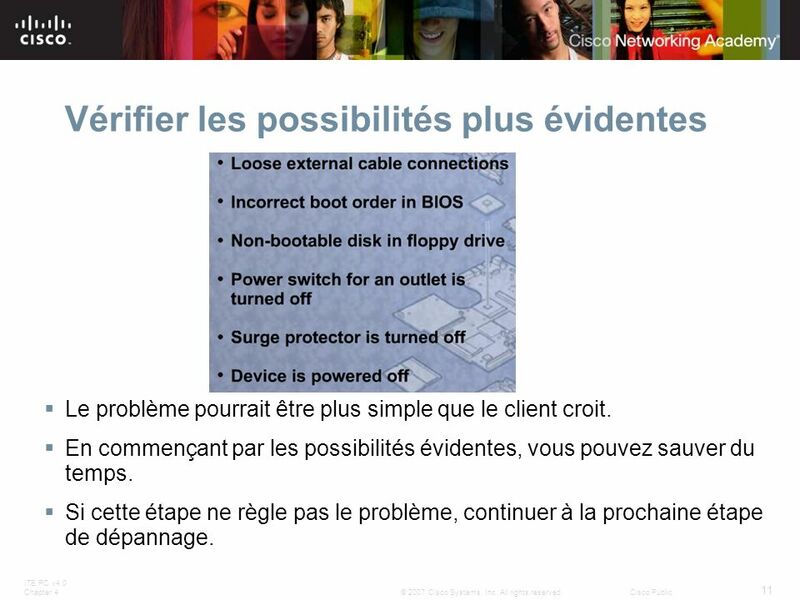 Télécharger ppt "IT Essentials: PC Hardware and Software v4.0"
Atelier Développement dune Charte Création de la Charte. Nobodys Unpredictable Enquête réalisée par internet auprès de 600 parents ayant au moins un enfant de 6 à 17 ans Avril 2009 Les parents et les logiciels. Guillaume KRUMULA présente Exposés Système et Réseaux IR3 Mardi 5 Février 2008. Confidential © , Amazon.com, Inc. or its affiliates. All rights reserved. Comment bien commencer lannée 2ème Partie: Ecoulez votre Stock plus. 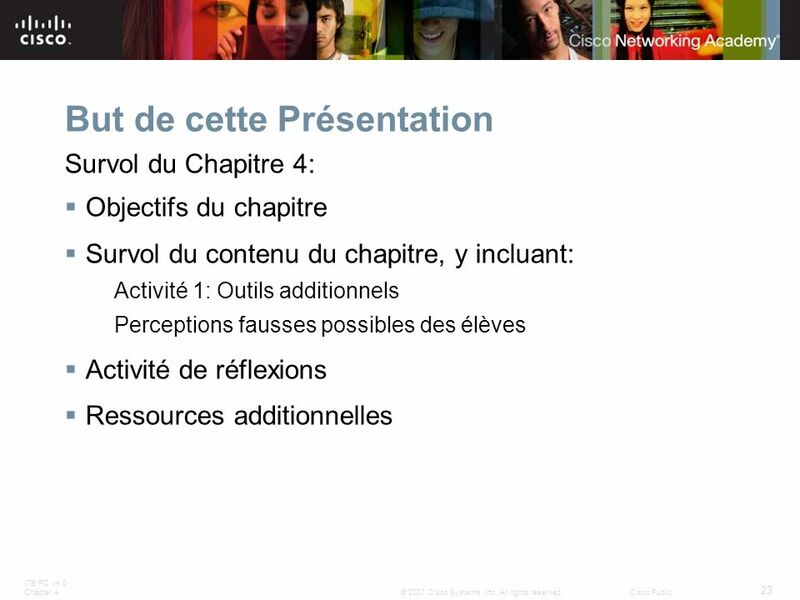 LE MODE SANS ECHEC « Des explications ? ». UN PROBLEME PRATIQUE « plante » Quoi que vous ayez pu faire ou même sans navoir rien fait, votre ordinateur.